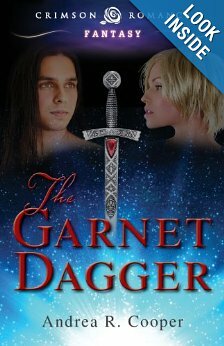 THE GARNET DAGGER by author Andrea R. Cooper is a Crimson Romance release for July 2013. Brock, though forbidden made frequent sojourns to human land. Then he was bitten by a vampire. It became a curse for him. Why was he then exiled? He must now find a witch who could free him. Could Celeste be that witch. He has to face difficult trials to find out. Could he kill her when the time comes? THE GARNET DAGGER was a well written story. The author Andrea R Cooper did fabulous world-building. The relationship depicted between the two main characters is flawless. And the description was very vivid. Highly recommended for all lovers of Paranormal romance.